My beginning watercolor students are required to make a color wheel. This exercise is not easy and at some point I’m certain they wonder, “Now What? How does this thing work and why do I need it?”. A better question would be, “How can I make this thing work for me?” Color theory is particularly relevant to professions such as painters, photographers, architects, interior designers, animators, graphic designers, print makers, filmmakers, hair stylists, in other words… anyone who uses color in their line of work. A color wheel is a visual representation of the color spectrum that is simply wrapped around a circle. 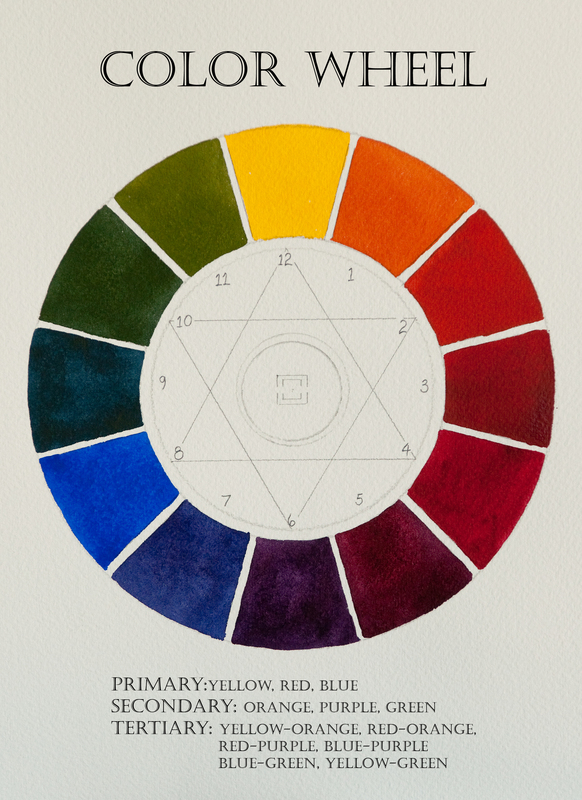 Color theory is the study of the positional relationships of these colors as they appear on this wheel, for example, yellow is always opposite purple and blue is always opposite orange. Opposite colors are called complementary colors. Color theory is considered a body of practical guidance that gives the artist guidelines as to the mixing of colors. It saves hours of wasted time and a lot of money in wasted paints. Mixing colors that are opposite each other on the wheel will result in grays, browns and other neutral colors; sometimes referred to as mud. A more controlled, careful mixing of these colors will result in beautiful grayed or toned down colors. Mixing complementary colors is the classic way of making neutral or toned down colors. All the hair salons know that understanding the relationships between primary, secondary and tertiary colors is essential. Color correction is a big deal to hair salons and when you understand the wheel concept you’ll be able to neutralize the unwanted tones simply by adding the complementary color. This entry was posted in Uncategorized and tagged art classes, color, color wheel, complementary colors, painting, pine mountain art classes, watercolor by brendastevens. Bookmark the permalink.